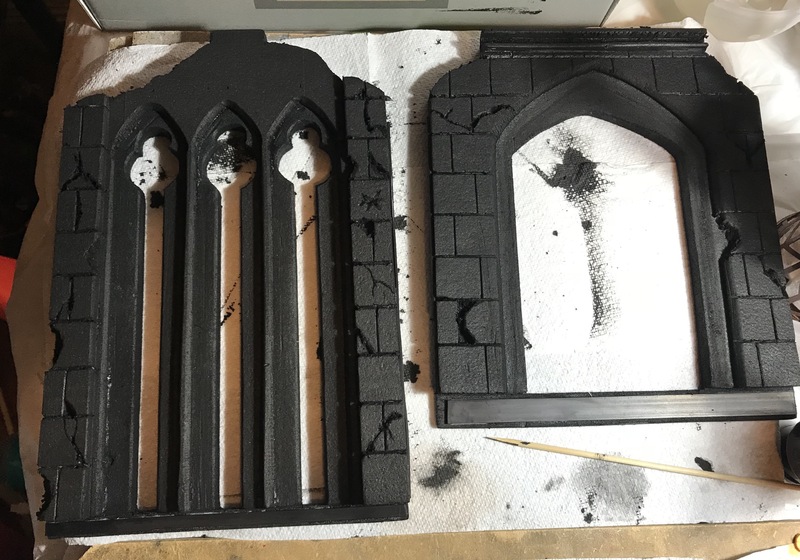 After completing the last Church Ruin I was asked to build another. 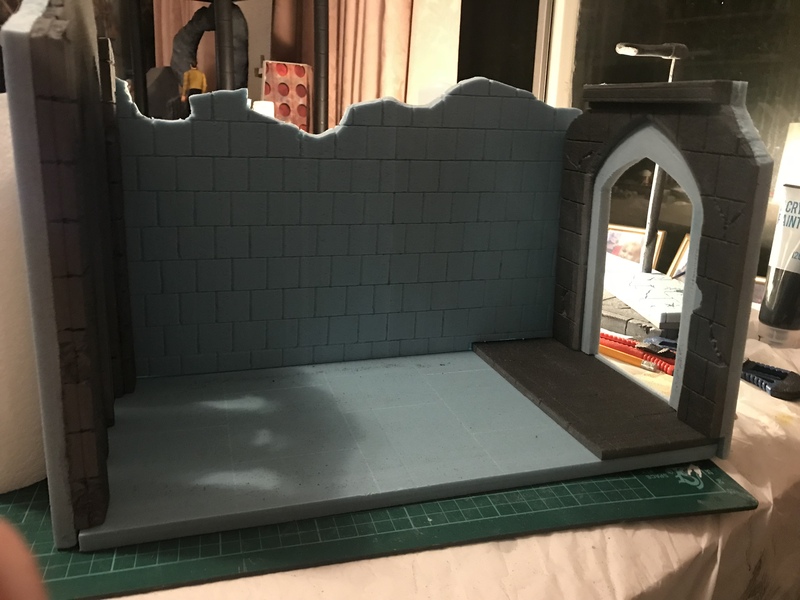 As you can see I’ve started work on the outer walls and floor. 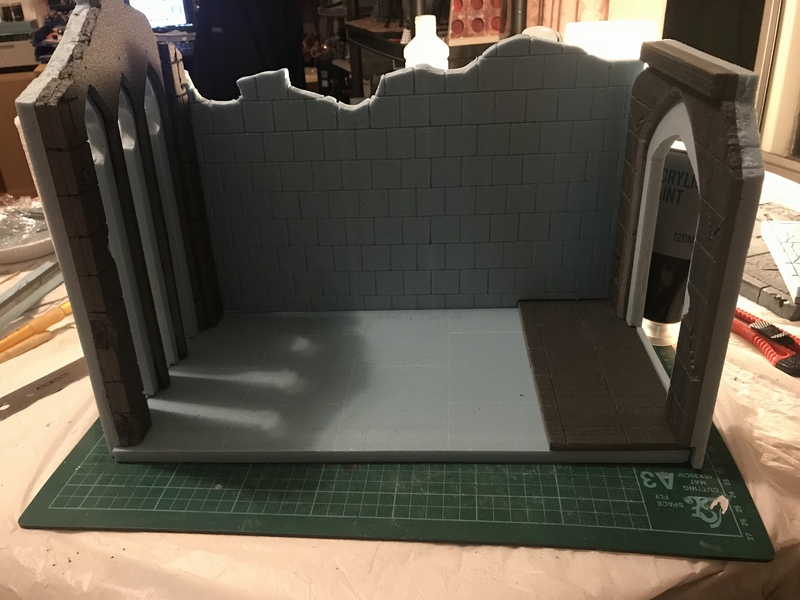 As you can see I have marked out the tall windows, the door and the brick work on floor and back wall. 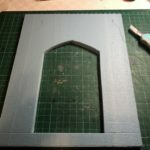 The long windows, where cut out and sanded down using my rotary tool, the doorway was also removed. 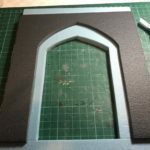 A piece of 6mm black foam board was cut for the archway to the door. 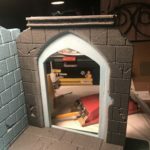 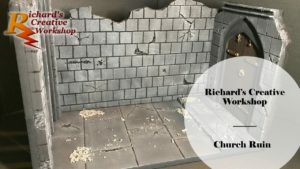 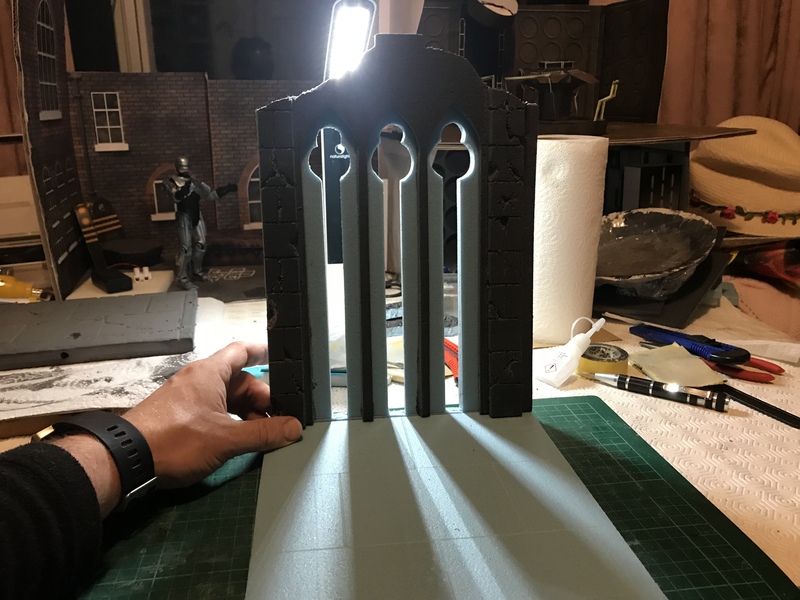 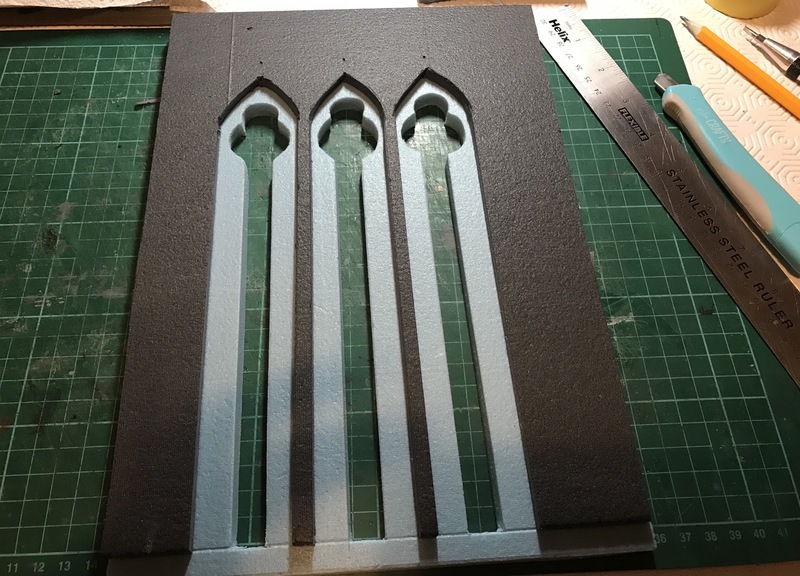 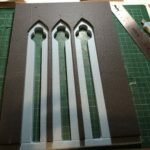 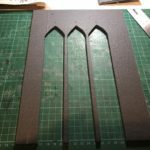 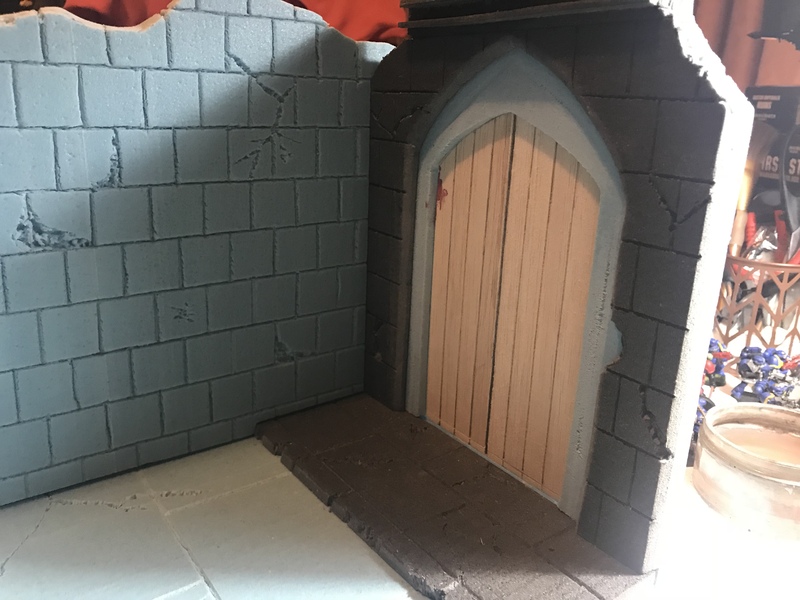 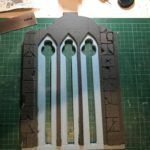 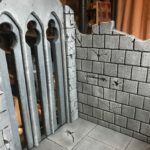 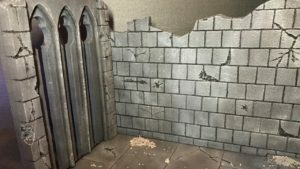 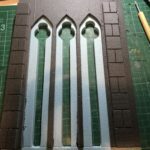 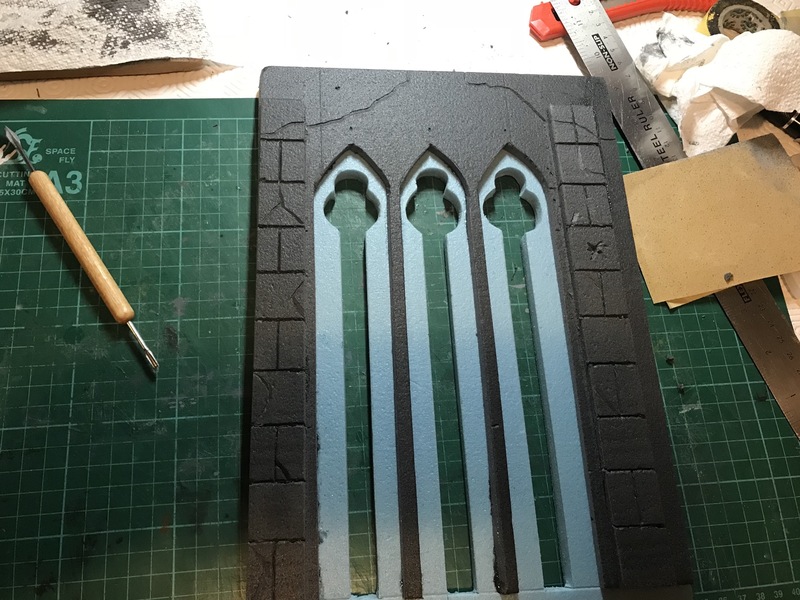 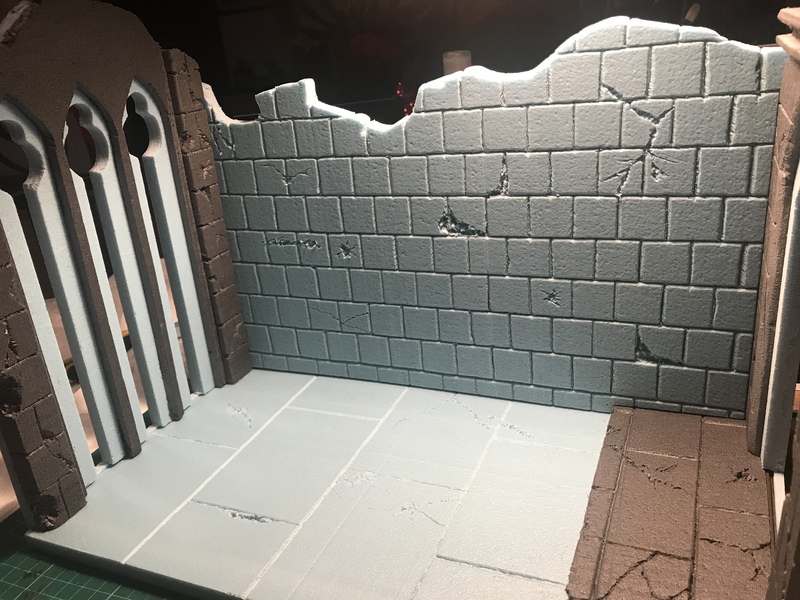 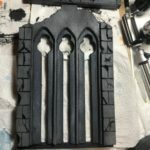 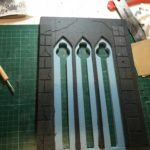 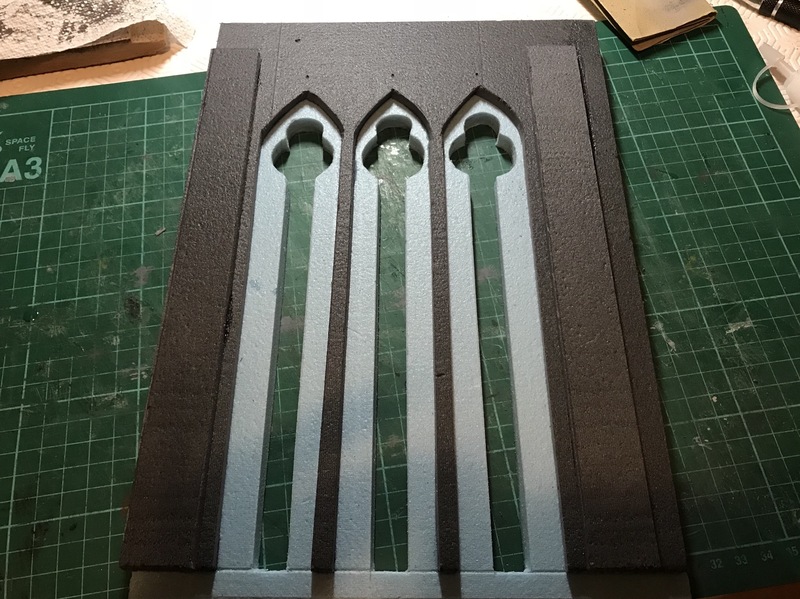 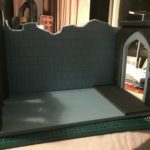 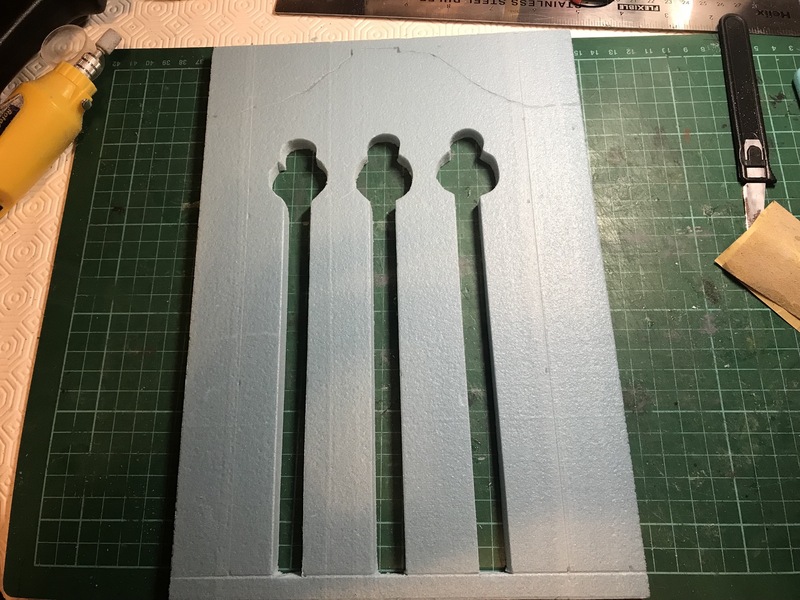 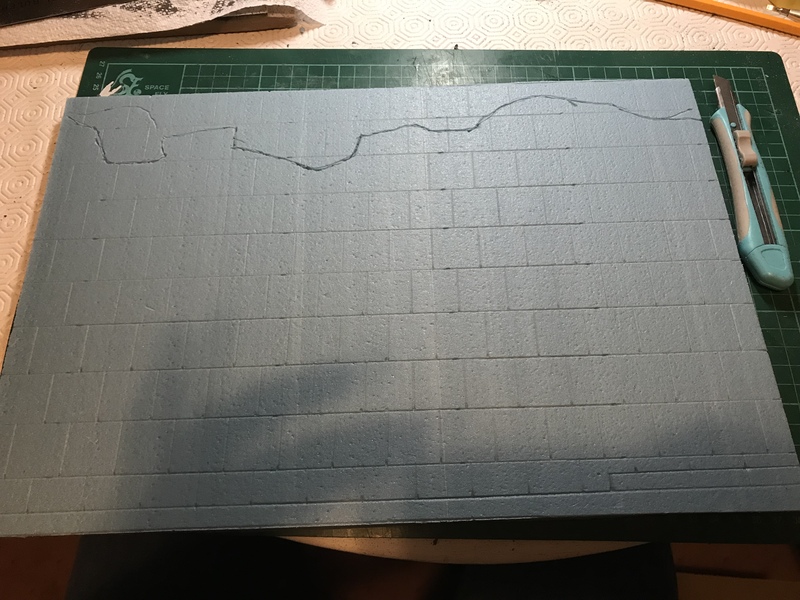 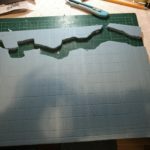 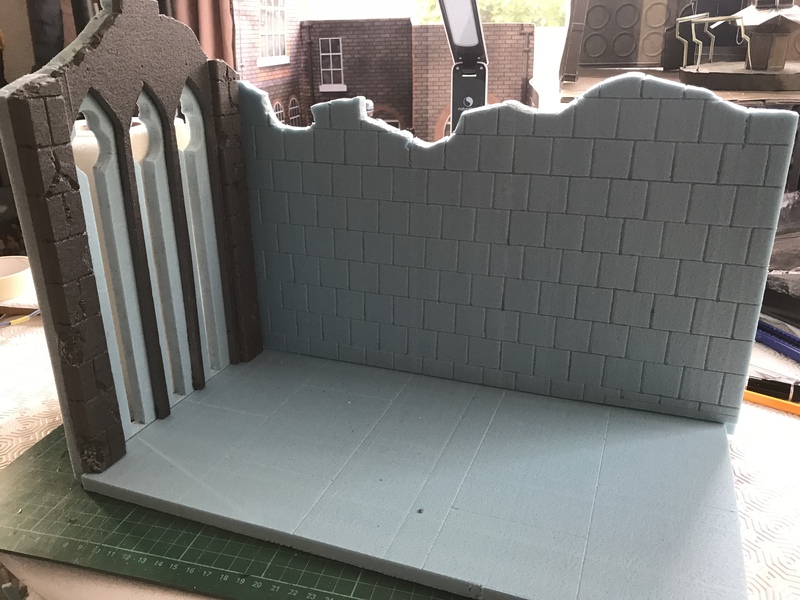 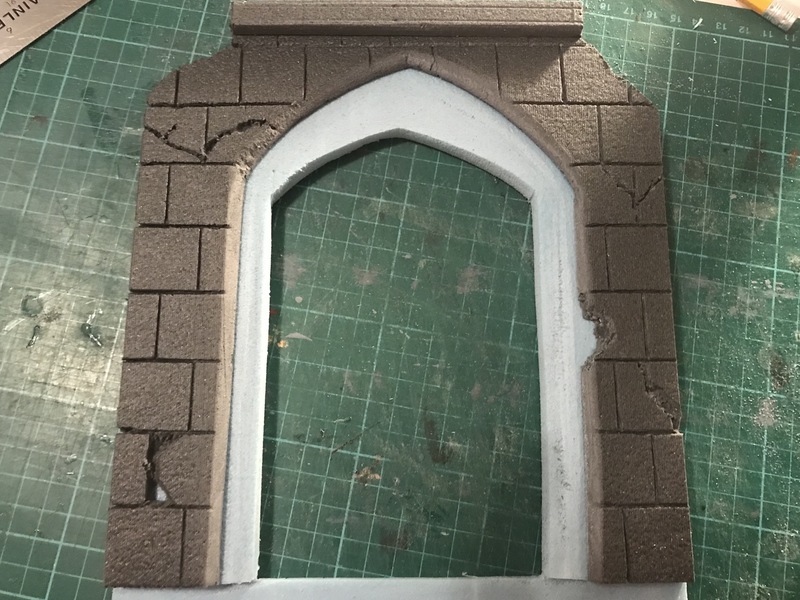 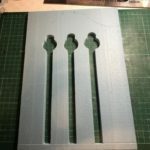 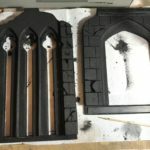 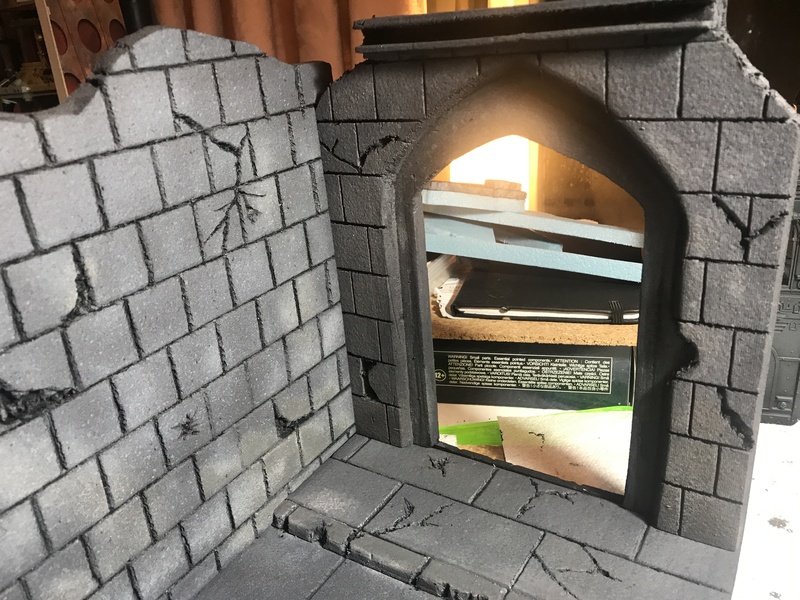 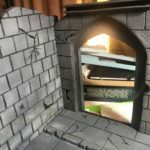 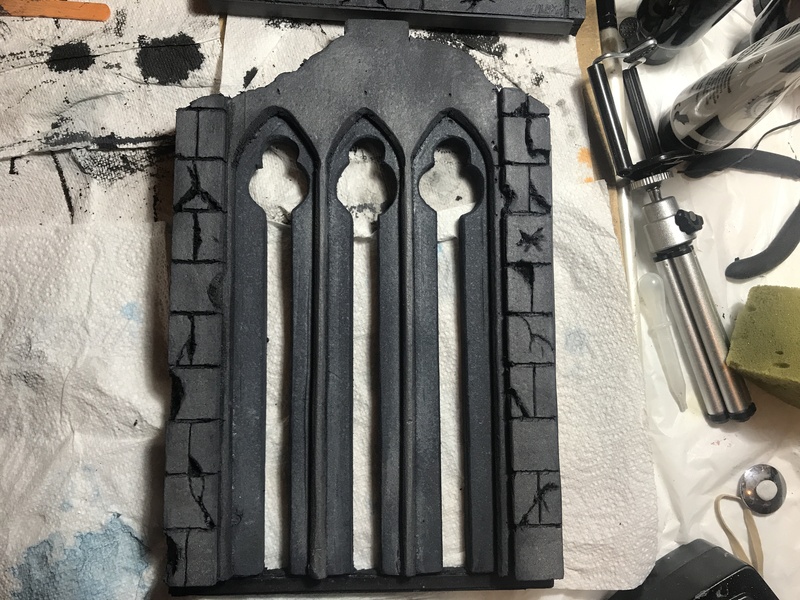 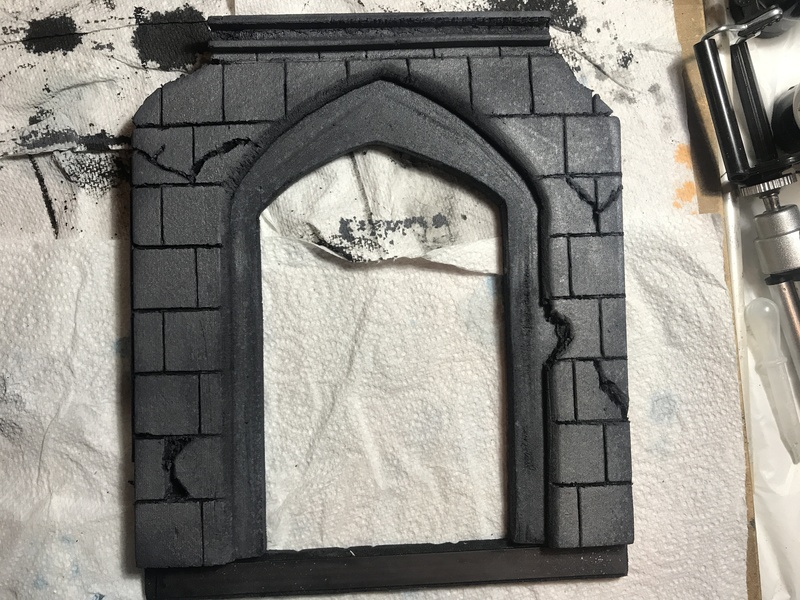 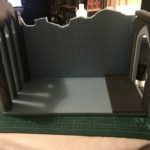 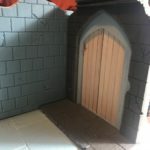 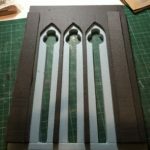 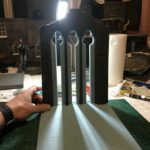 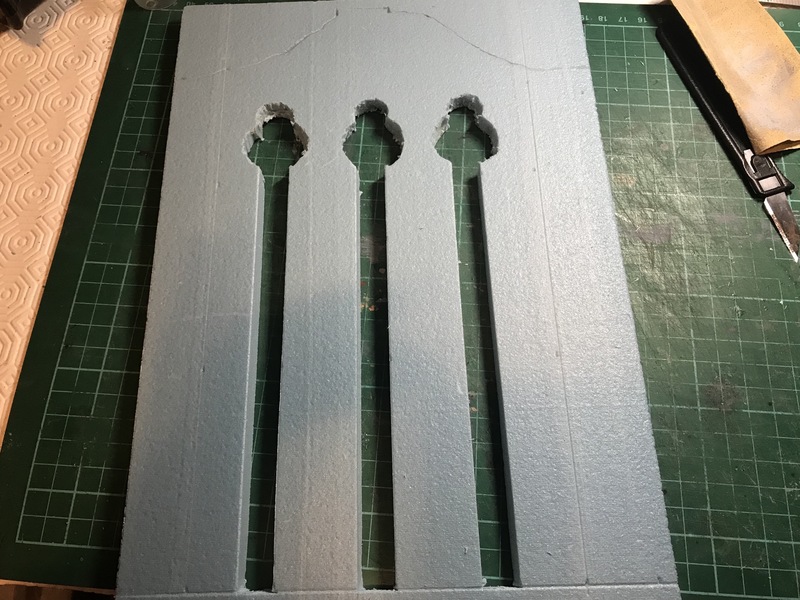 As with the previous Church Ruin diorama I made, I cut a piece of 6 mm foam board to fit over the wall and then cut out three arches which will house the three tall windows. 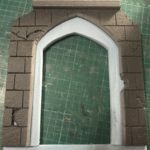 I cut a couple of 10″ x 1″ strips of 6 mm to go either side of the window, 1″ x 1″ brick work were etched into these strips before applying damage to them. 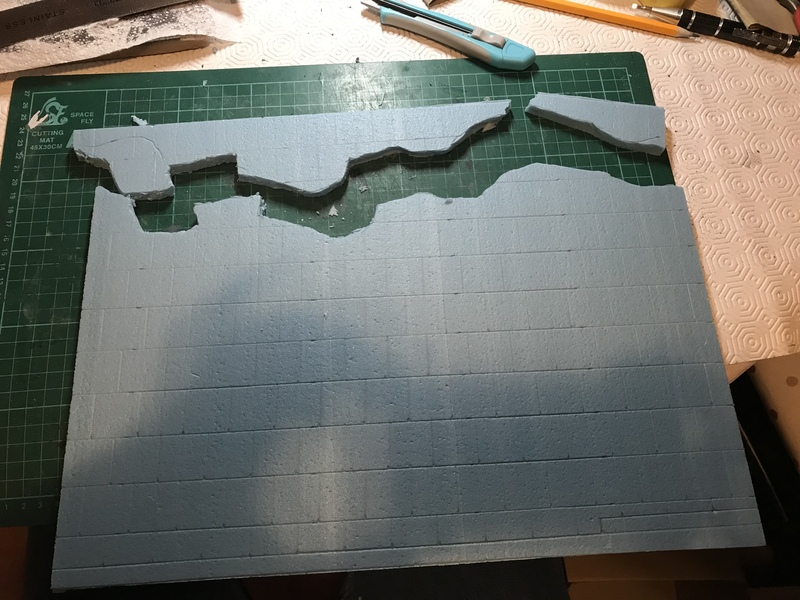 All the pieces were glued to together before cutting the top down as I did in the previous model. 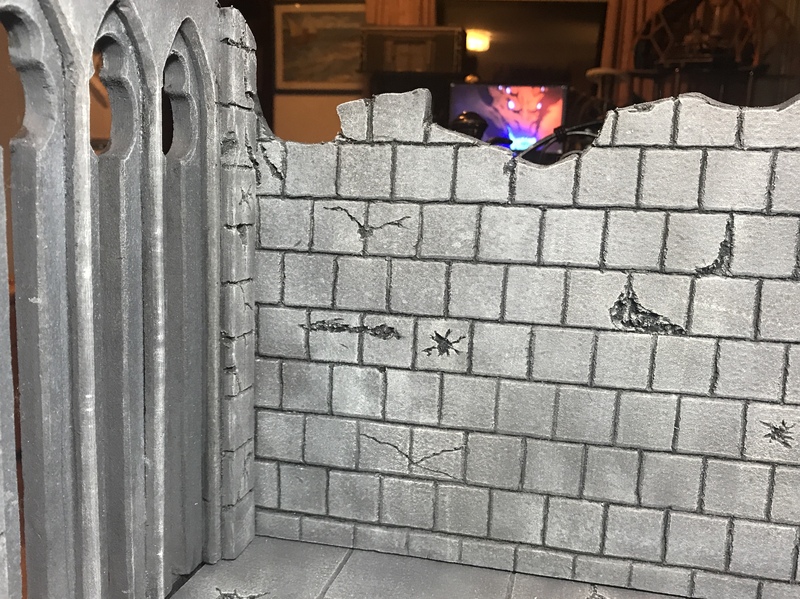 The back wall as with the former I etched in 1″ x 1″ brick work before marking and cutting the top of the wall off as I did before. 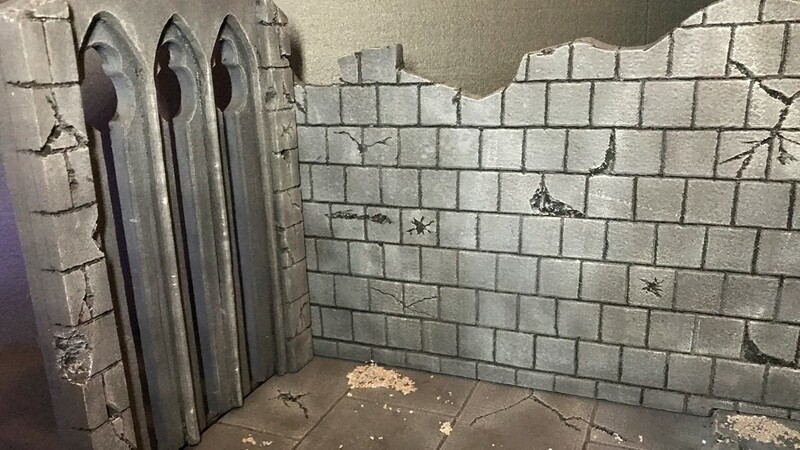 Like the before all the broken pieces will be reused as rubble for the final piece. 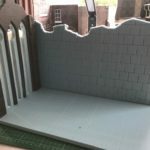 The right wall I have built it similar to it’s predecessor, using a combination of 10mm and 6mm foam board. 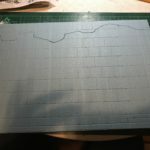 I marked out and carved 1″ x 1″ brick work on this wall. 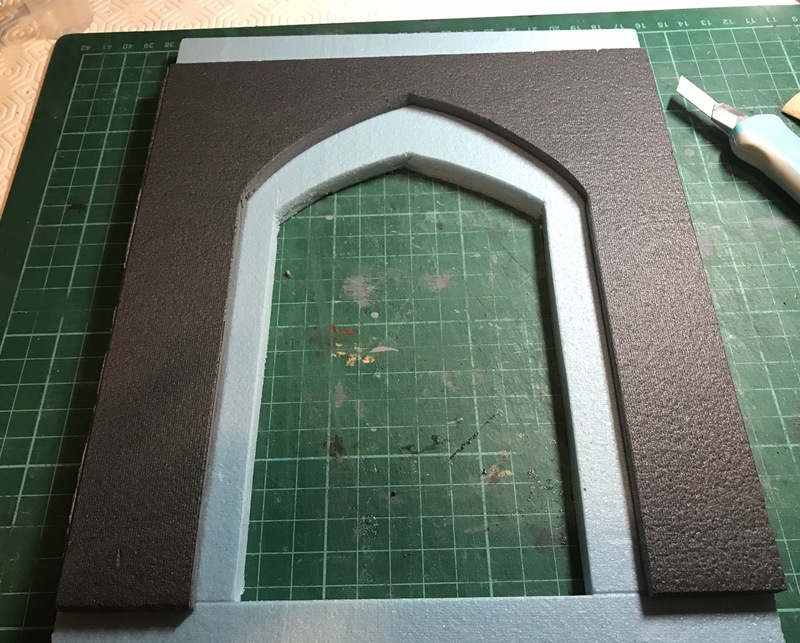 Glued a 1″ x 8″ pelmet over the door which I will be taking my rotary tool too like, marking out 2 x 0.2″ top and bottom border. 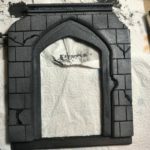 Taking a sharp knife I removed pieces from the top corners which will be used as rubble to scatter round this piece, damage was applied to the brick work similar to the last piece. 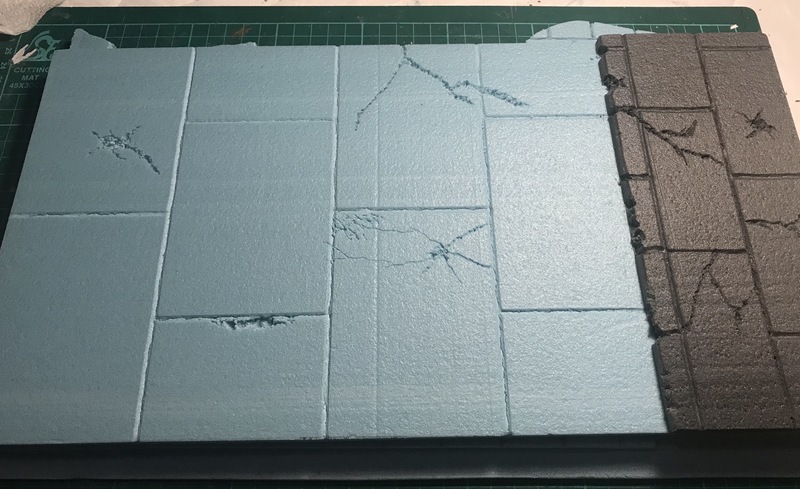 With the floor I marked out slabs of 3″ x 4″. 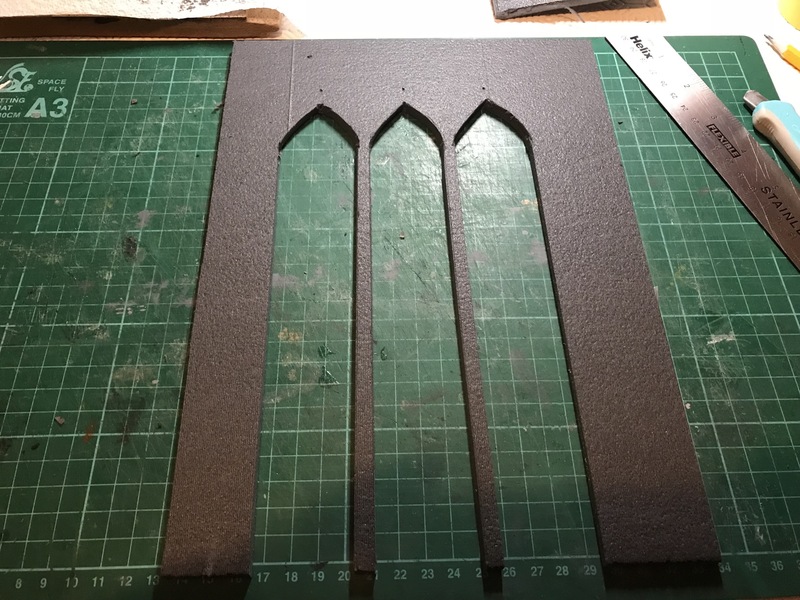 I then stuck a piece of 6 mm black foam board 3.5″ x 8″, glued it down to the far right corner. 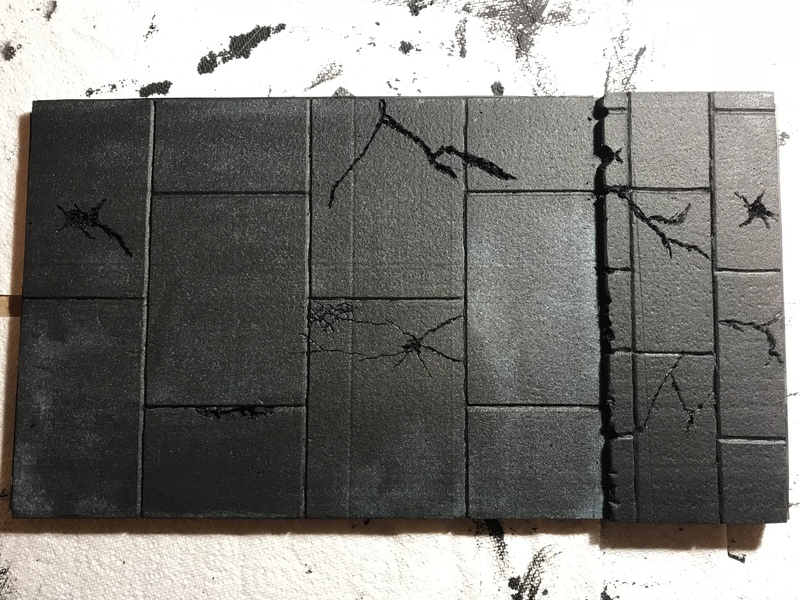 This is to be the entrance to the room, I carved out 2″ x 3″ slabs on it. 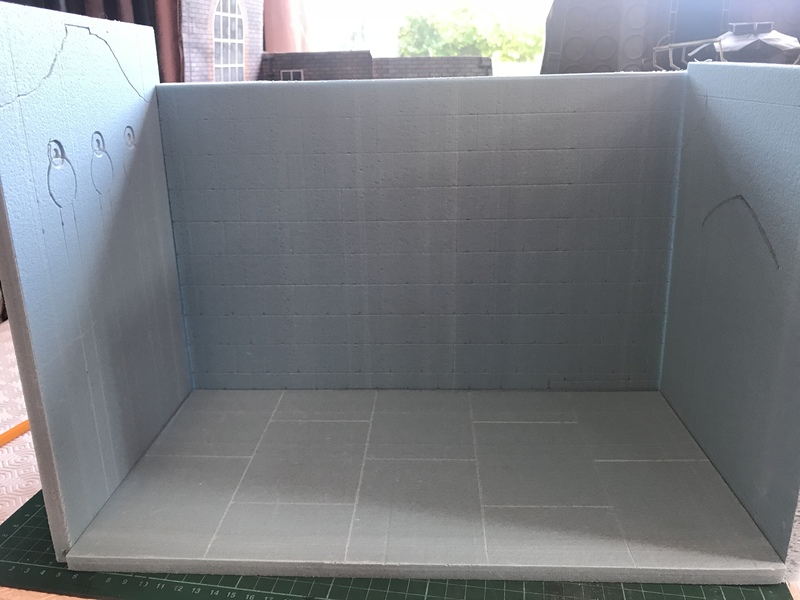 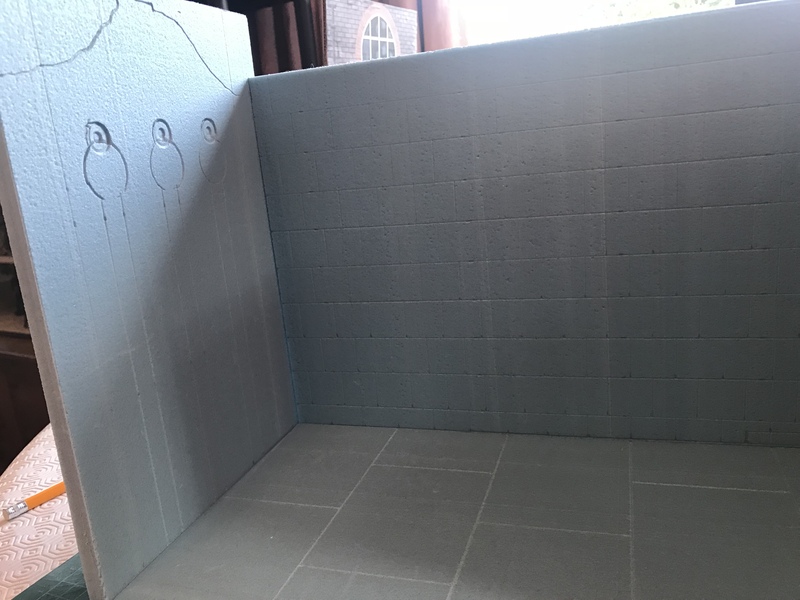 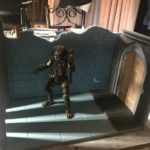 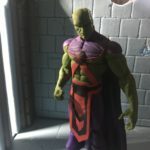 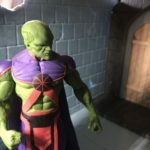 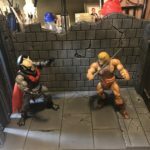 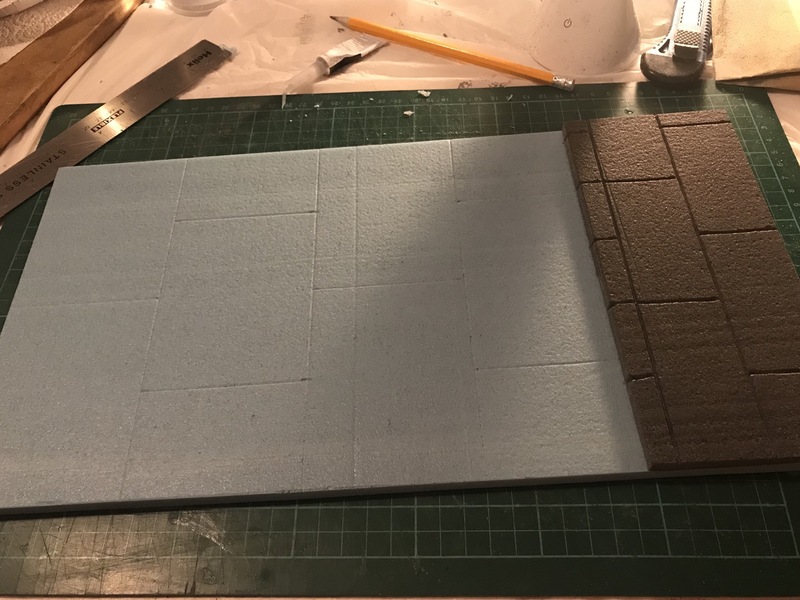 Once this was accomplished I have applied magnetic strip along the length and width of the floor and the walls to hold the diorama in place. 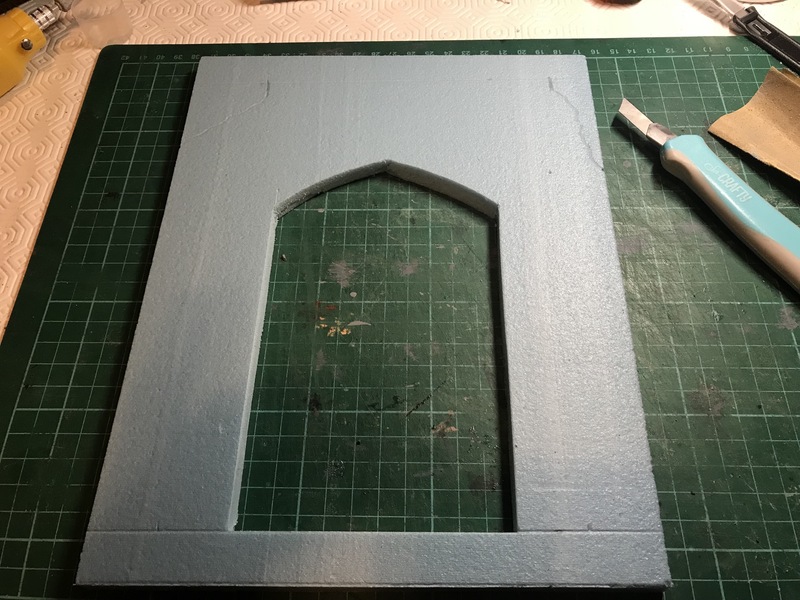 Using my rotary tool with the sanding attachment I went around the edges of the three long windows and frame to remove all square edges. 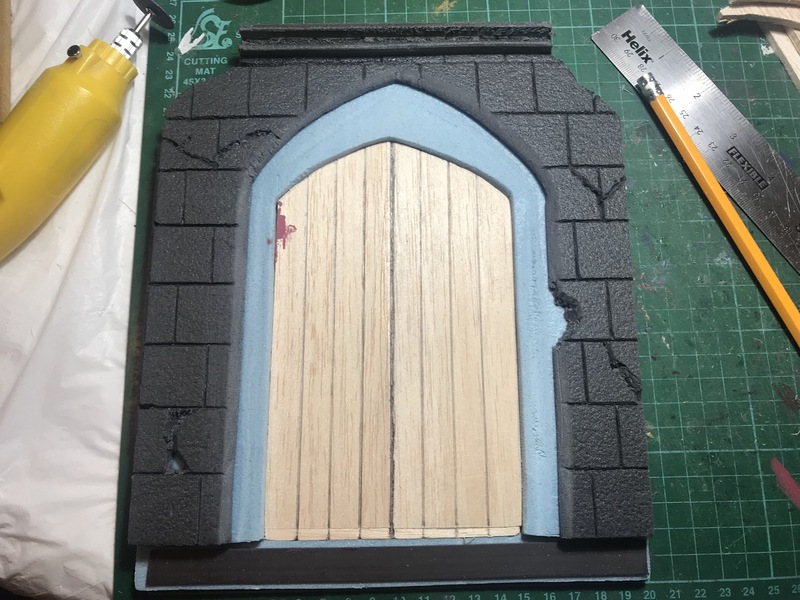 With the final wall finished and attached to the other surfaces using magnetic tape, it was time to work on the wooden door. 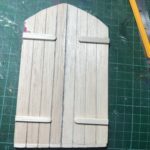 Cutting a couple of pieces of bolsa wood to size then sanding it down, I marked the wooden beans that make up the door. 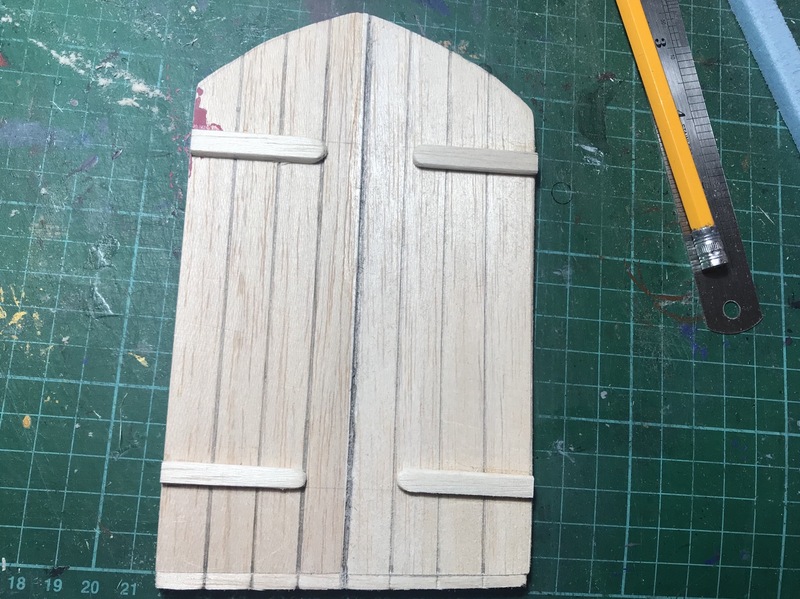 Four smaller pieces were cut to act as the hinges then all pieces where glued together. 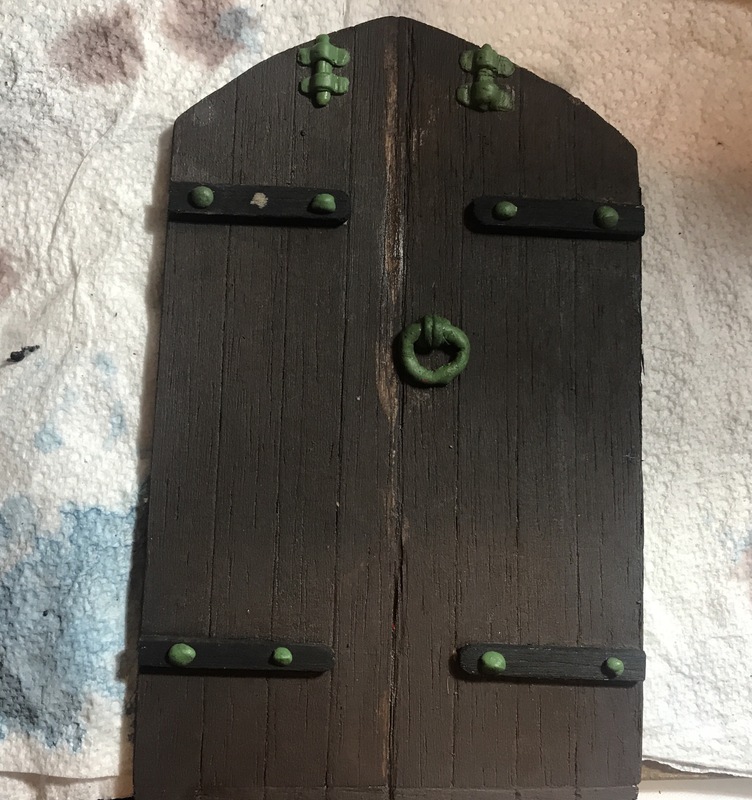 When this dries, it will be time to make the door handle and bolts out of Green Stuff as I have done previously. 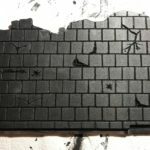 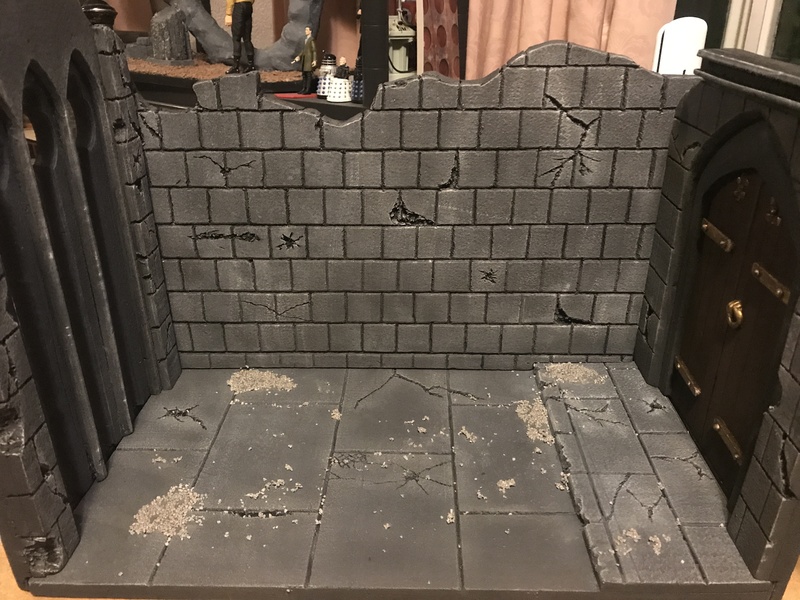 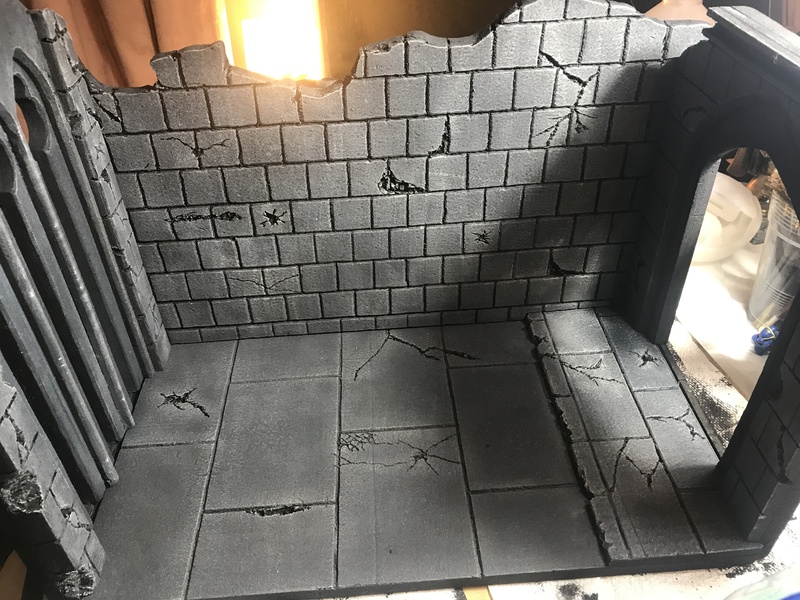 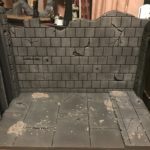 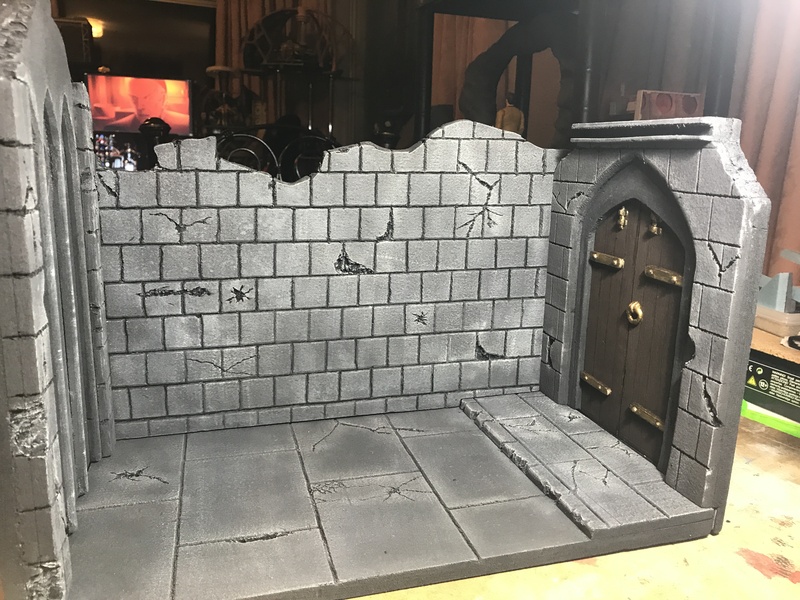 Using down watered black acrylic I applied a black base coat to all sides of the diorama using a sponge. 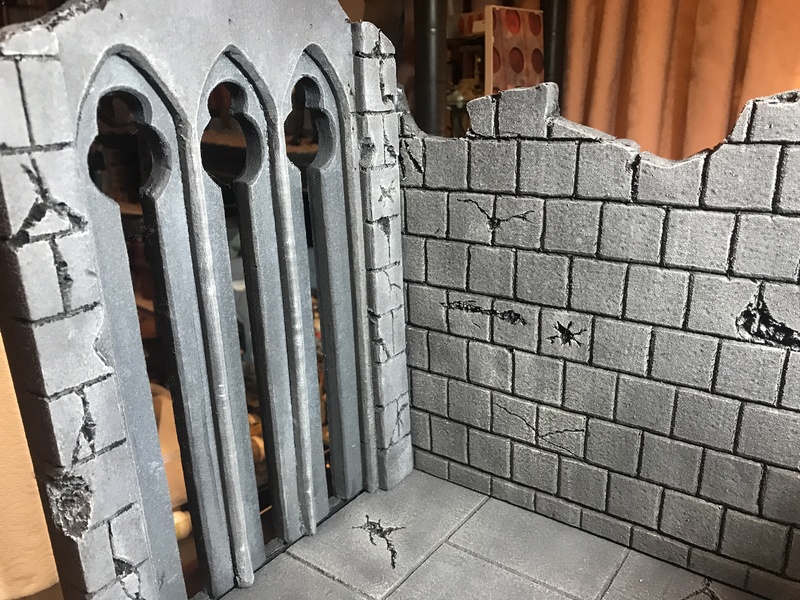 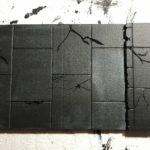 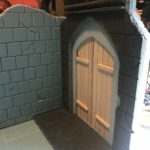 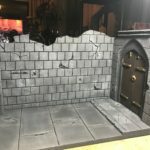 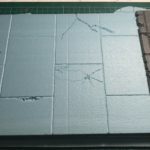 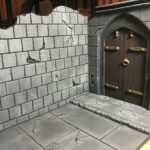 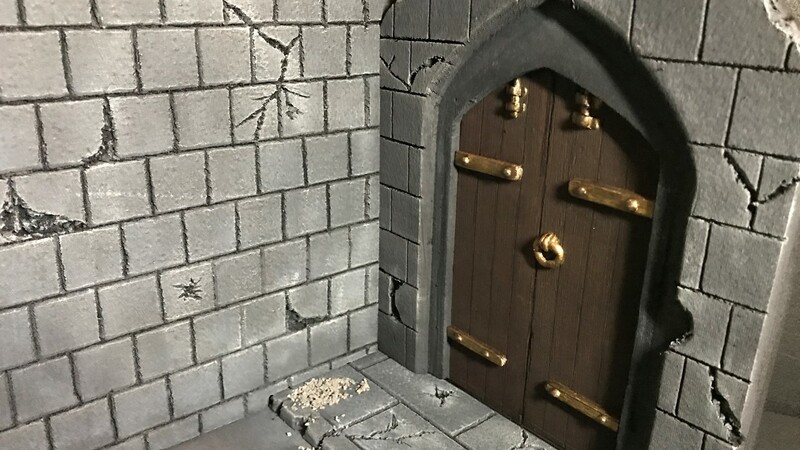 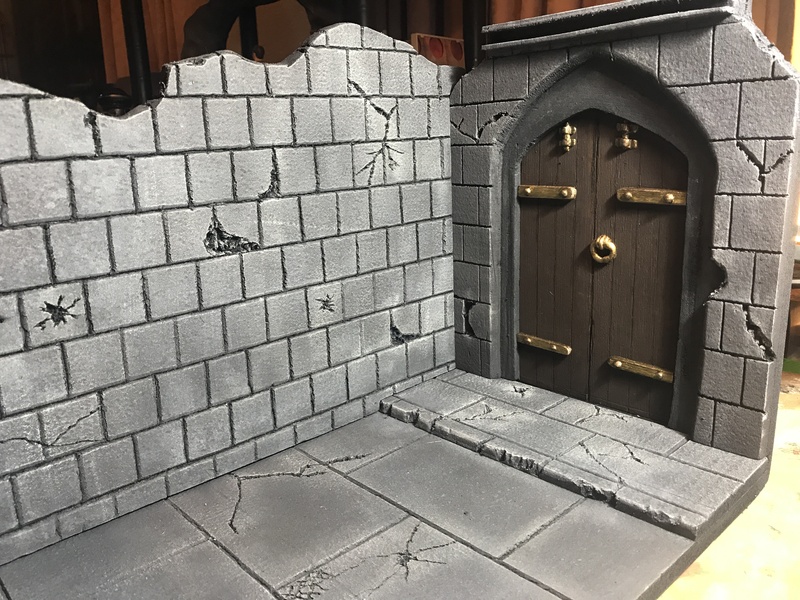 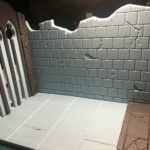 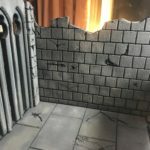 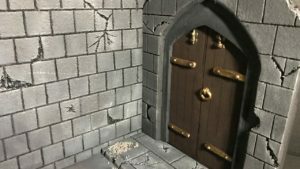 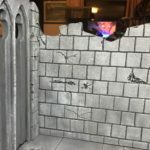 With this technique I am able to apply an even coat across the surfaces, while also able to push the paint into all the crack and crevasses. 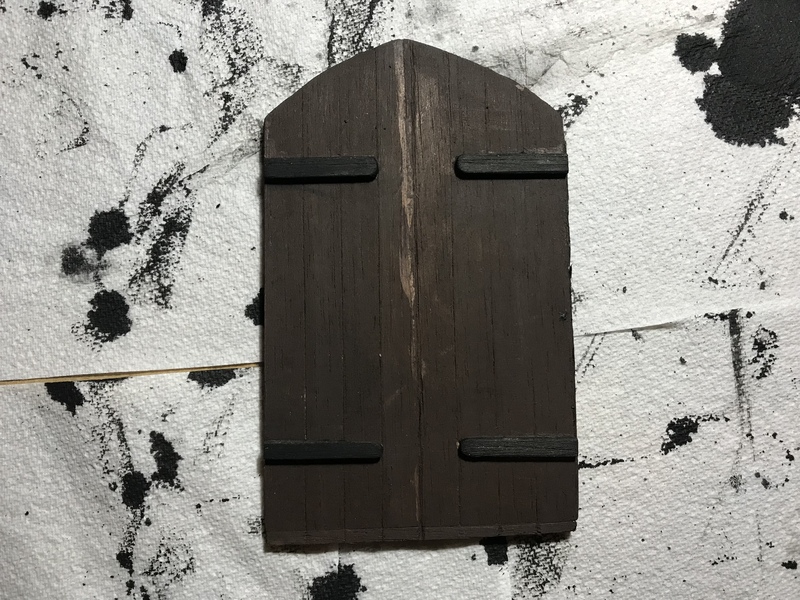 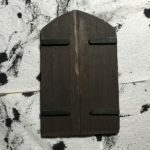 The wooden door was given a base coat of burnt umber for the front with black for the hinges. 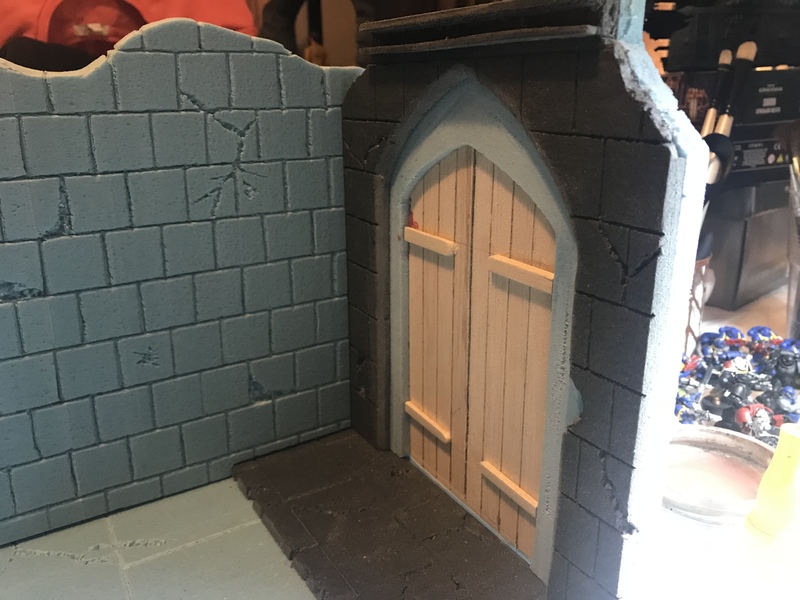 The back of the door was painted black to match the outer walls. 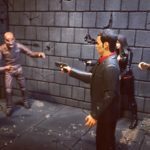 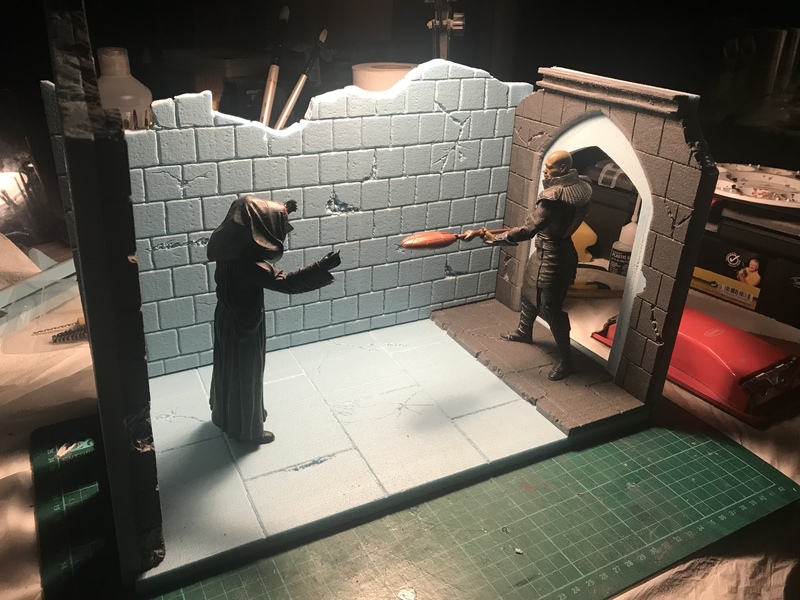 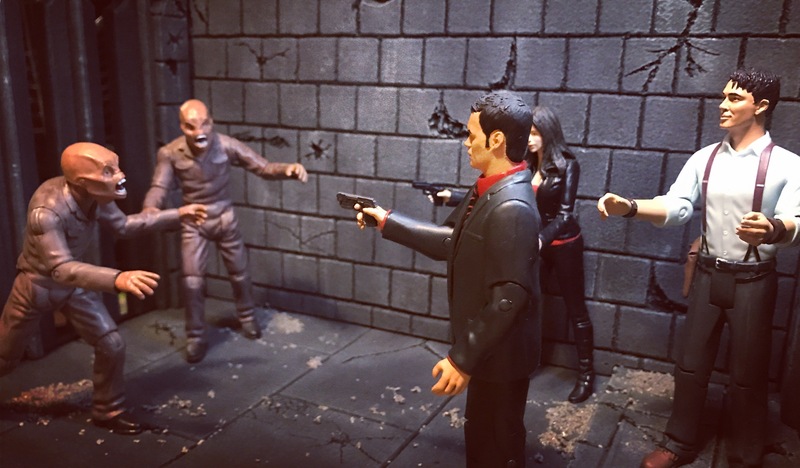 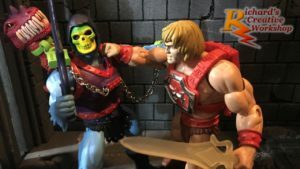 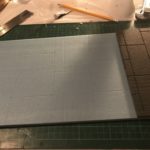 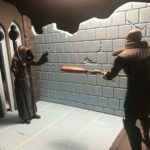 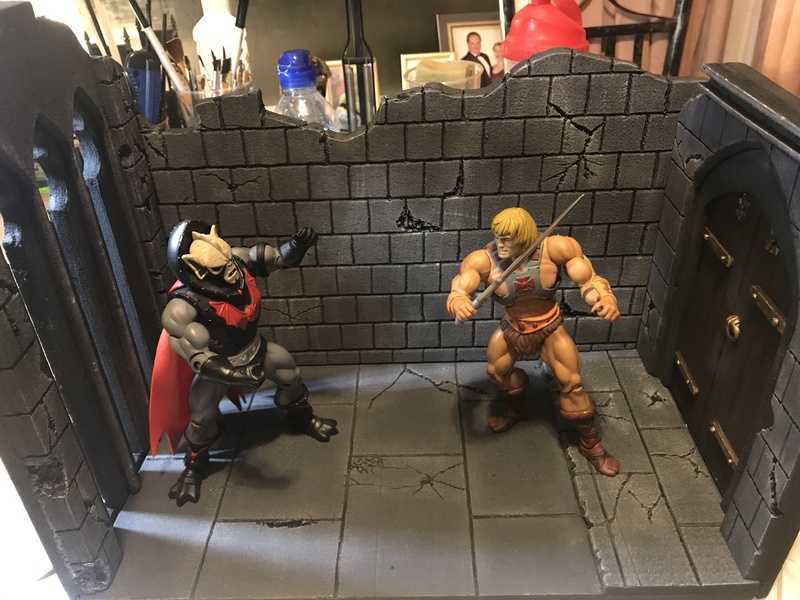 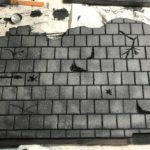 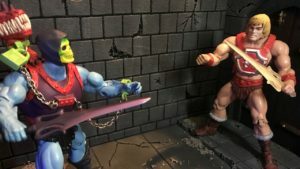 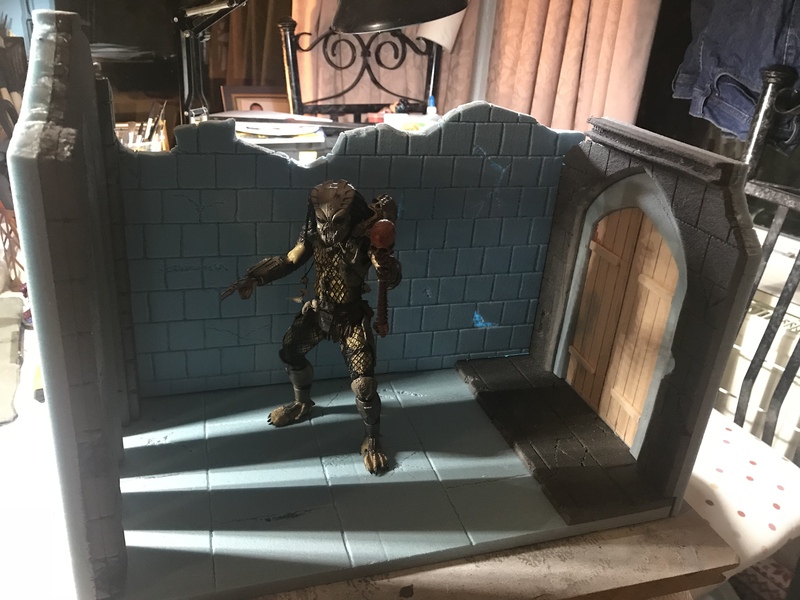 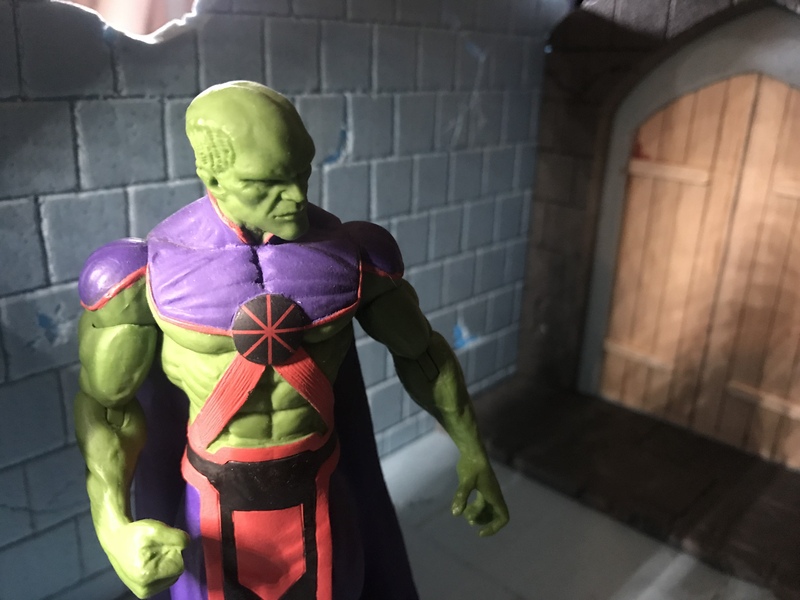 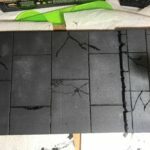 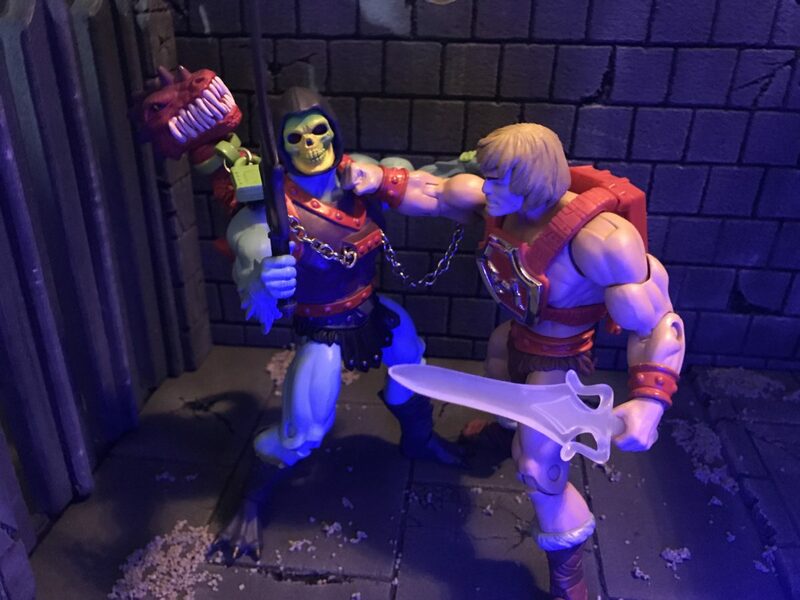 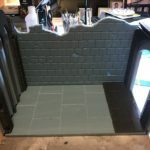 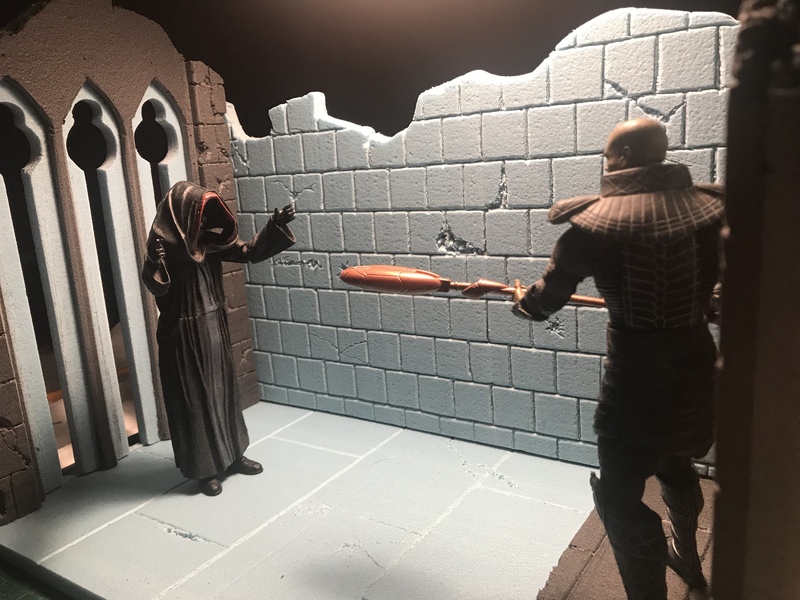 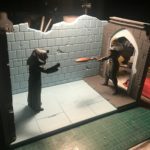 Unless I am creating a double sided diorama I always paint the back black, more especially when using the blue foam board. 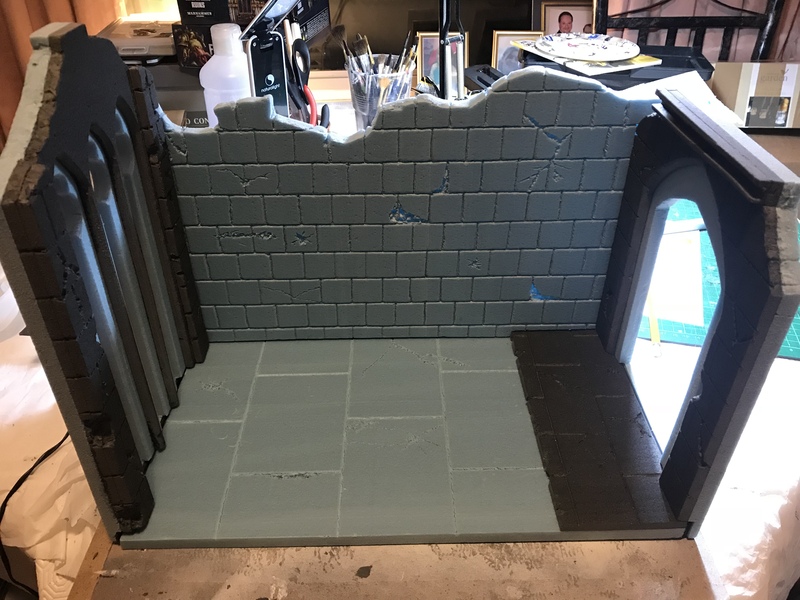 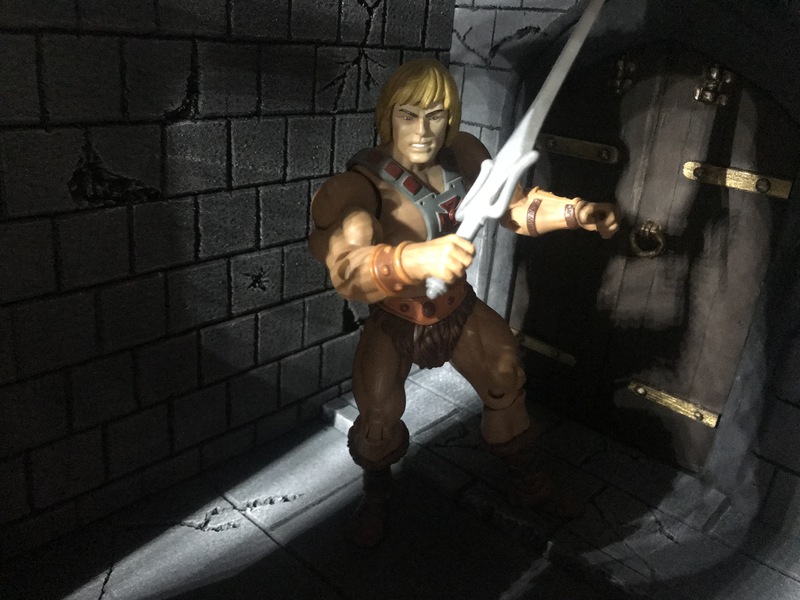 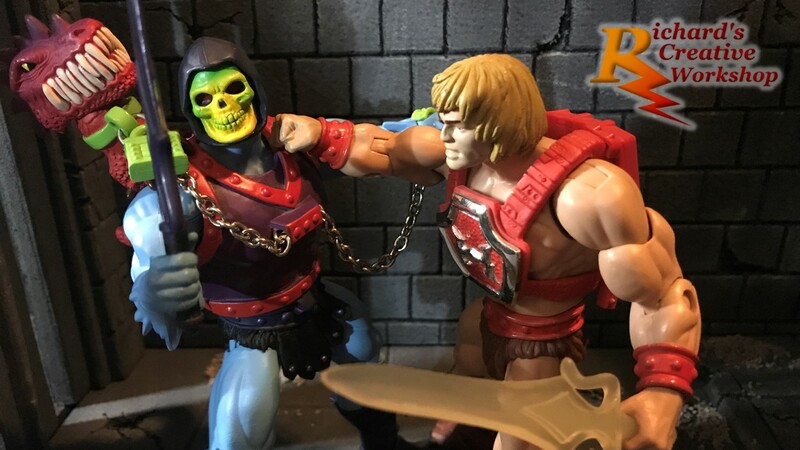 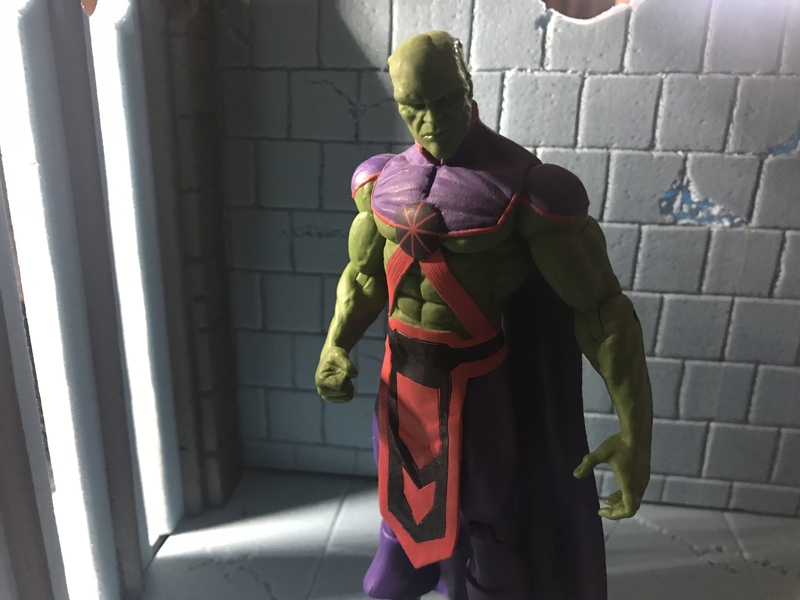 This helps prevent any blue seeping through when a light is shown from behind the diorama. 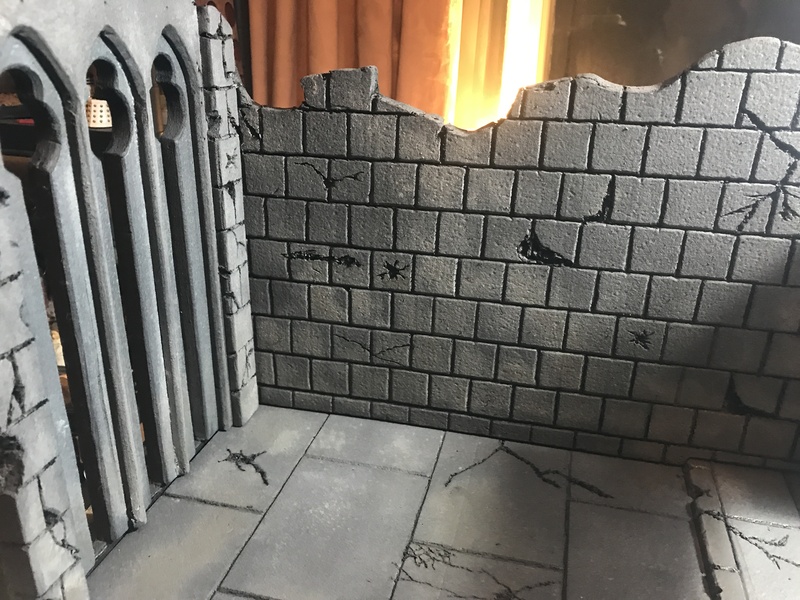 Latest work done on my Ruined Church diorama. 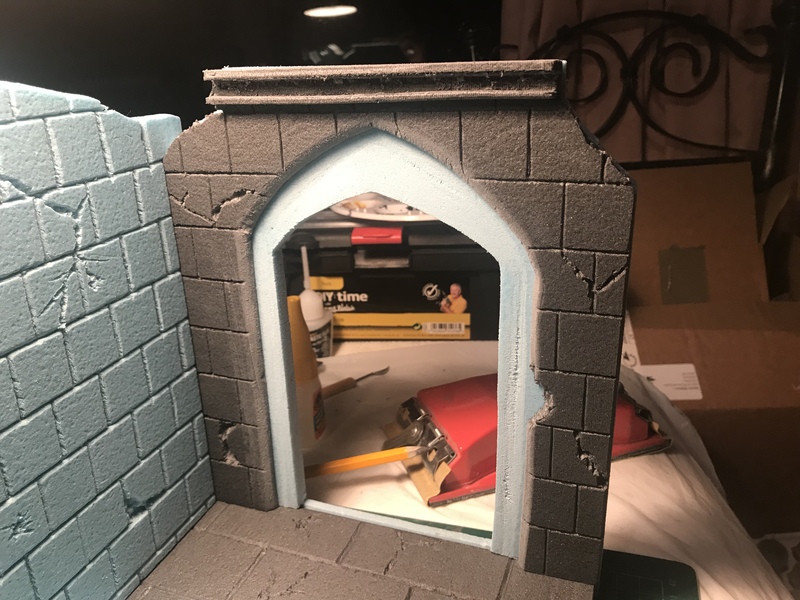 Mixing up a grey was I went over the the walls that surround the long windows and the door. 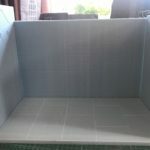 Adding a touch of blue to the mix, I then sponged over the remaining walls with the new paint. 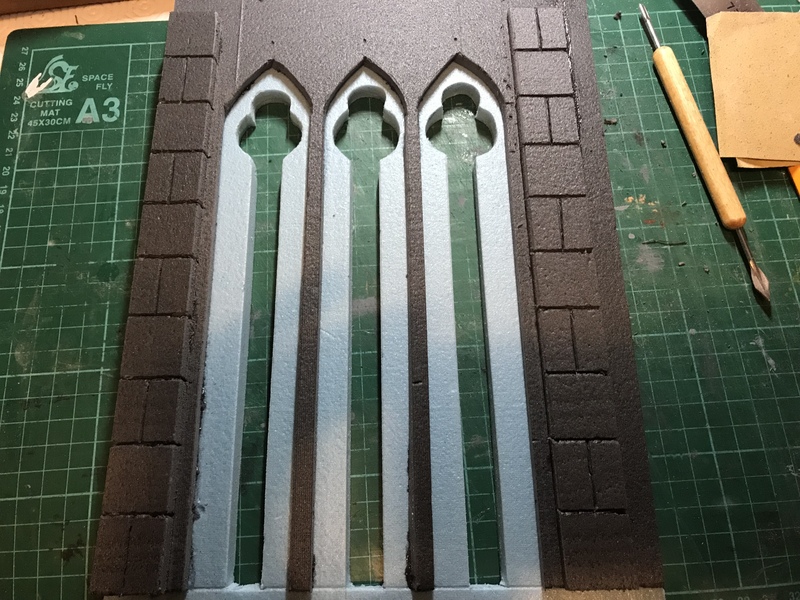 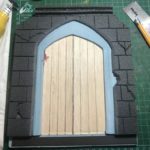 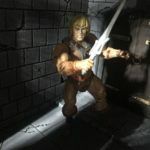 While is trying, I started working on the accessories for the door. 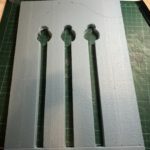 Using Green Stuff to make the bolts, door handle and the bolts for the hinges. 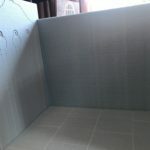 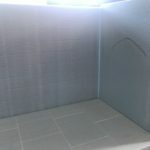 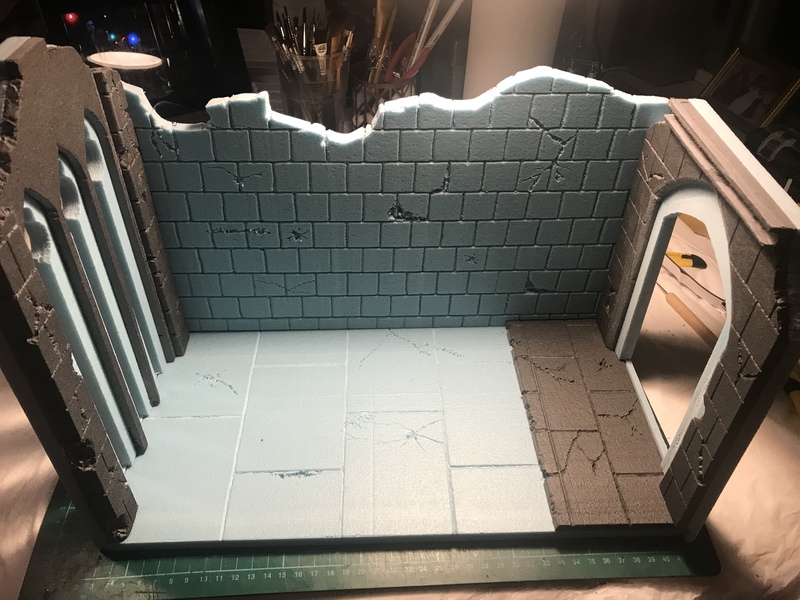 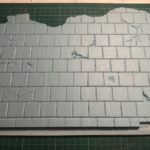 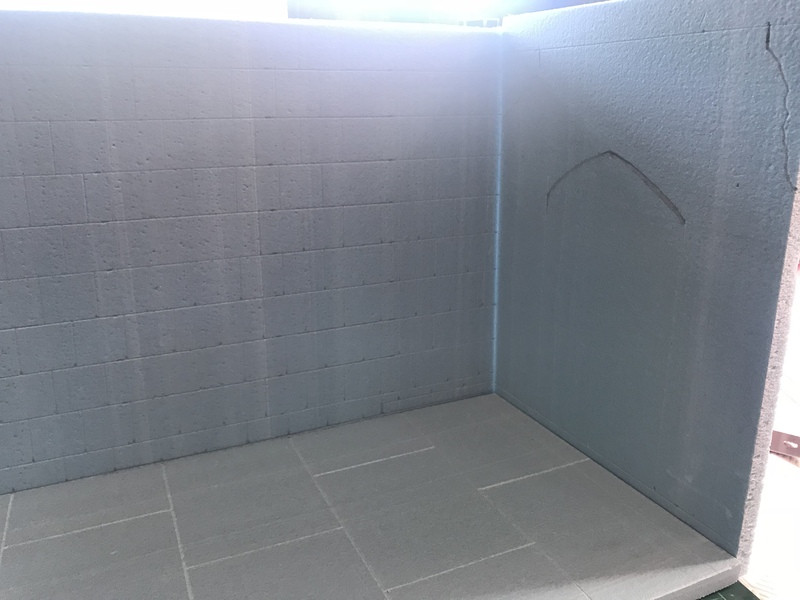 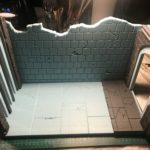 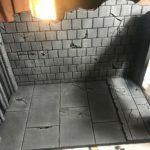 With the paint dry I went over the wall and floor again with a light grey/blue wash using my airbrush. 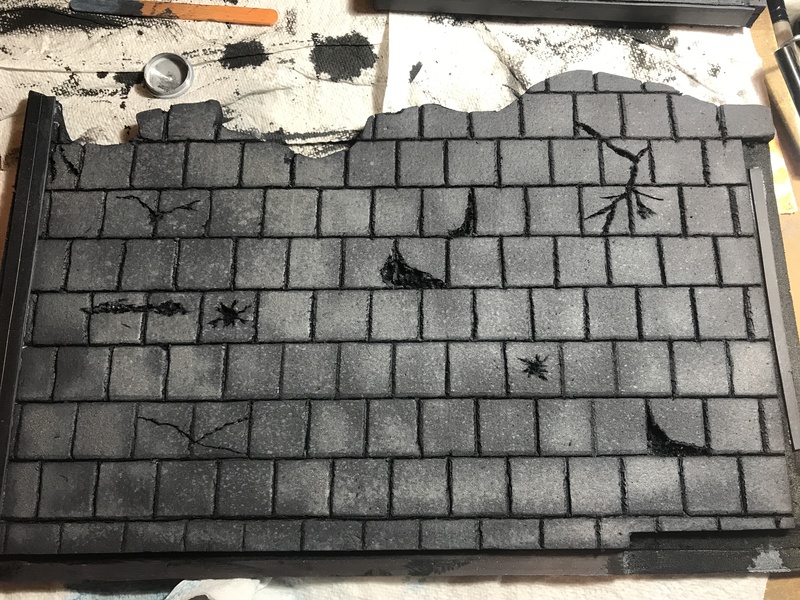 After this had dried I dry brushed GW Longbeard grey over the entire diorama to pick out the edges, the cracks and imperfections of the piece. 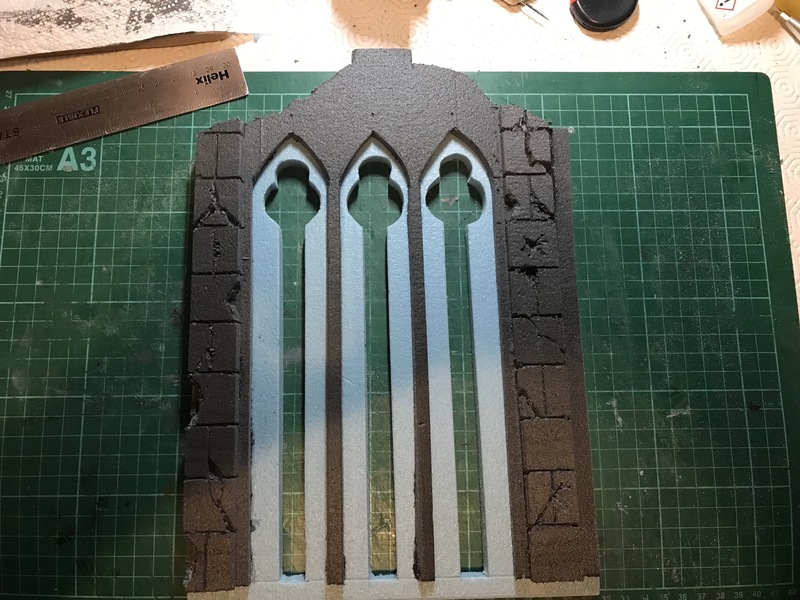 For door got a watered down wash with GW Rhino hide, retributor armour for the hinges and accessories. 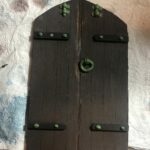 A layer of Nuil oil and then Warplock bronze over the Green Stuff made accessories, once dry all it was all edged with Auric Armour Gold then the door was glued into place. 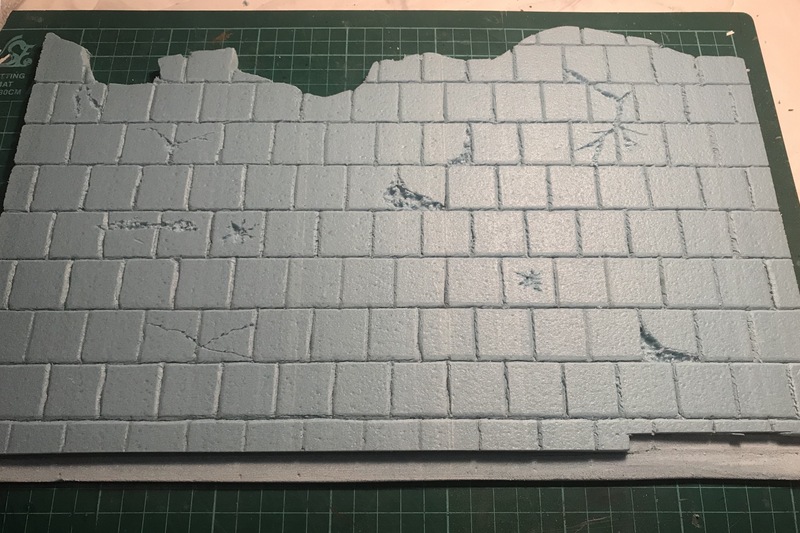 I have also added patches of rubble using scenic ballast scattered across the floor, this now needs some finishing touches and should be completed. 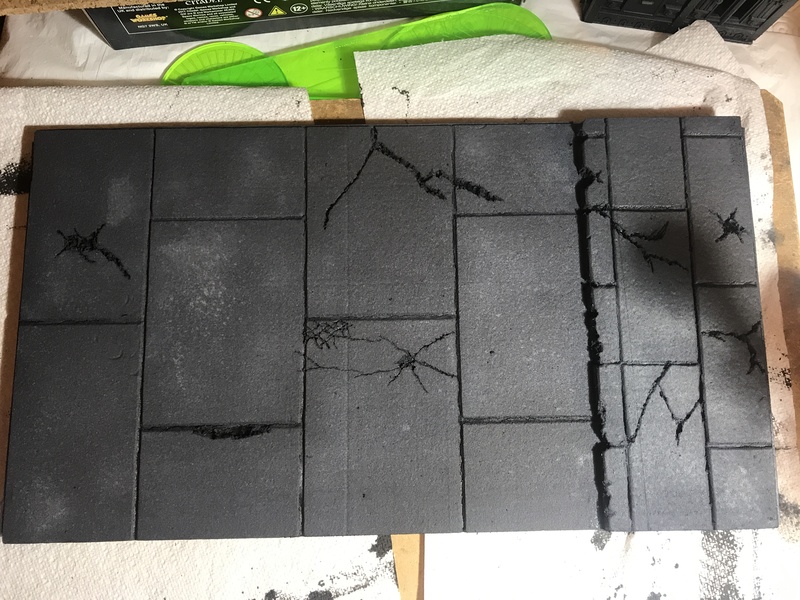 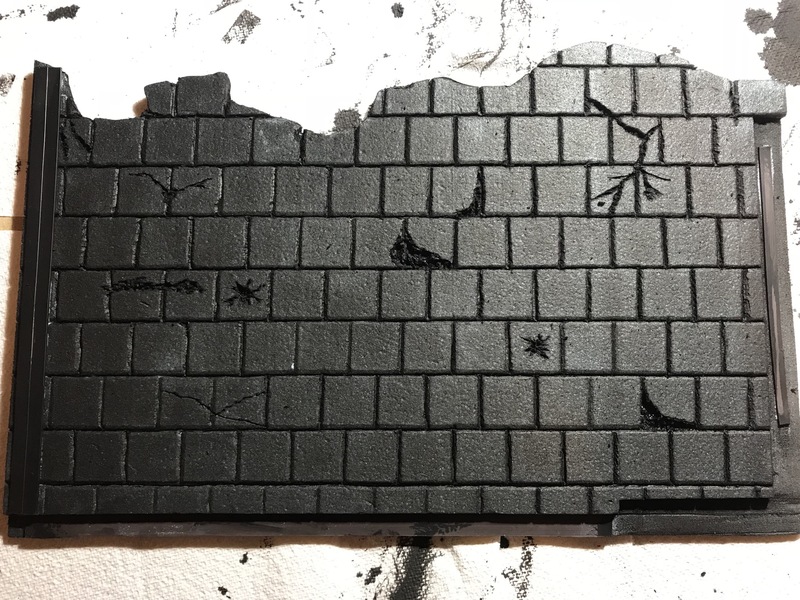 The back of the diorama was given a final coat of black acrylic drawing this diorama build to conclusion.